"I know they are in my corner when I need them and they are rooting for me to succeed." "I can’t say enough about the care I received at Jackson, LLP. I know it sounds strange to say “care” about a legal firm but that is exactly how I felt working with both Erin and Connor. They are hands on, professional, punctual and they truly care about me and my business. I know they are in my corner when I need them and they are rooting for me to succeed. I would highly recommend them for any of your legal needs." K.L. "Without their guidance, I don’t know how we would have gotten up and running." "My partner and I set up our Physical Therapy practice over a year ago. Having never been practice owners before, we had no idea where to start the process. 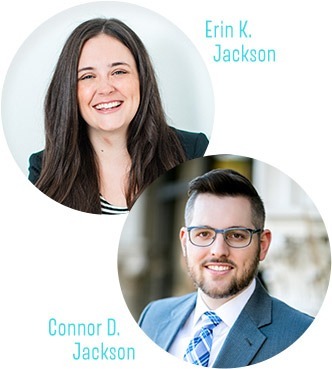 Connor and Erin were fantastic resources helping us establish our articles of organization for our business as well as HIPPA policy and procedures. Without their guidance, I don’t know how we would have gotten up and running. They also helped us navigate the legalities of our scope of practice regarding the different services we wished to offer. We have had them represent us in other matters over the past year as well and can’t speak highly enough to the quality of their work. Their expertise in healthcare law is invaluable to a private practice owner. Call them!!" J.R.
"They have come up with solutions for the questions that I didn’t even know to ask." "Erin and Connor have been so helpful! They are incredibly knowledgeable about healthcare and wellness practice. They have answered my questions and come up with solutions for the questions that I didn’t even know to ask. Thanks Erin and Connor for all your help!" C.L. "I couldn’t ask for a more detailed and reasonably priced law firm." "Fantastic team! My pharmacy used them for a while now and I couldn’t ask for a more detailed and reasonably priced law firm. My pharmacy hired them for consulting services, document prep, legal reviews and contract drafting. Every project was on time and exceeded expectations in every way. Highly recommended!" S.M. "They are down to earth, honest, kind, and authentic people." "Working with physical therapy practice legal experts has been one of my business needs for way too long. I had never been able to find lawyers that understood both the law, the physical therapy clinical world and my efforts in the education and telehealth space. Previous poor legal advice had left me unknowingly unprotected and taken advantage of. Enter Erin and Connor Jackson. I love them. Not simply because of their legal acumen, or their incredible support so that I am clear on their recommendations and provided documents, or their specialization in physical therapy practice needs…but they are down to earth, honest, kind, and authentic people. I feel wisely guided, protected, and cared for…by my lawyers. Seems like a rare combination to me, and I am truly grateful. I cannot recommend them highly enough, don’t wait to love your lawyers!" J.W. "Erin and Connor were extremely helpful in getting my niche Physical Therapy business up and running from a legal standpoint this past year. They went the extra mile in helping me understand what should be including in my policy and procedures as well as answering countless questions via emails and phone conversations with follow-up summary notes so I did not have to panic to write everything down during our meetings. They researched out my unique business demands of practicing in 2 states and helped me feel legally safe to start my first healthcare business independently!" E.W.